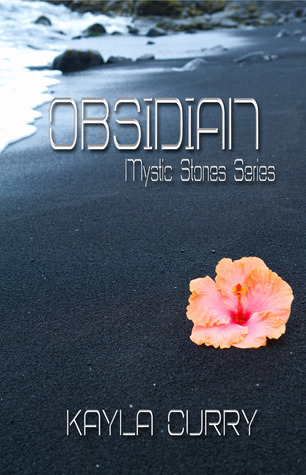 Kayla Curry’s Obsidian is the first book in her planned Mystic Stones series. I wasn’t familiar with her work prior to this one, but after reading the summary on goodreads, I was intrigued. Set in the year 2020, the world has become completely dependent upon technology, to the point that societies can no longer function without it. Then comes the day that the technology fails. Cars stop working because they are dependent upon GPS satellites to simply drive down the street; computers won’t work without the internet. And on islands like Hilo, Hawaii where our story takes place, food supplies can quickly become scarce when ships can no longer travel the oceans. Within the first few chapters we meet our protagonist, Ava, a building manager whose company rents out office space. We also meet Tom, another main character, who we quickly discover is one of the vampires behind the technological collapse in order to coerce humanity into trading their blood for use of technology. When Ava spurns Tom’s offer of becoming a vampire like him, she goes on the lamb and we meet a colorful group of characters including surfers, rogue vampires, and an immortal with a secret of his own. This group decides to band together to try and take down the vampires and save humanity, starting with the group on Hilo. Overall, I loved the premise of this book. It was a fresh and original take on the vampire/supernatural mythos. I really, really, wanted to like this book. However, the main plot of technological failure quickly takes a side rail to the romance between Ava and Tom, and later Ava and Jesse. There is a brief Twilight-esque love triangle between Ava and the two men, which further muddied the plot for me. While the love story interwoven in the main plot isn’t necessarily a bad thing, I felt that she could have done much more with the technological angle. If the lack of technology is supposed to be such a world-changer, it isn’t really shown as much more than a minor inconvenience in Ava’s world. Newer cars won’t start, and computers won’t run, but paperwork still exists in the year 2020. Restaurants are still able to cook and serve food, and there are still plenty of cars and motorcycles and boats that work perfectly well without GPS. There’s also some aspects thrown in that defy the suspension of disbelief, such as when one of the characters, Hui, asks Ava if she still throws [knives], and she replies with a comment about being rusty, but yes. Nowhere in her back story does it ever mention that she would have a hobby such as throwing knives, and there would be no reason for a building manager to have a skill like that. Another such example is (minor spoiler here) Ava’s own progression from mere mortal to powerful immortal. In the course of a few chapters she experiences a build-up of power that defies logic and sense. Even characters such as Laurel K. Hamilton’s Anita Blake and Kim Harrison’s Rachel Morgan went through a progressive buildup of power. Even to say that Ava was born with this much power, there should have been hints of it earlier in her life, and even earlier in the story, that would have made more sense. The aforementioned examples also had their moments of failure with their powers, which makes them more believable, while Ava’s powers never go awry or fail her at any time. The other consequence to a power build up so great this soon in the series is that the author leaves Ava no room to grow as a character. This book had a lot of promise. Like I said, I really wanted to like this book, but the more I read, the more I felt as if the story pacing and character development was lacking. The characters were likeable, and I enjoyed the use of Hawaiian slang and pidgin. Unfortunately I would hope that in future books we would see more of the main story and less of the romance, and more character development, but I have to say I was disappointed with this one. Ava Tanner finds herself in a world without satellite technology in a time of GPS, Smart phones, and Tablets. When she discovers that a corporation headed by vampires with sinister motives is to blame, her world is turned upside-down. After a narrow escape, she learns a mystical secret about herself that could aide her in her fight against the vampires. Unfortunately, the vampires see her either as an asset or a target. When the world is on the brink of complete social and technological destruction, one must ask themselves: Would I give up my blood for the modern ideal way of life, or will I risk my life and wage war with the overlords of chaos? Kayla Curry lives in North Platte, Nebraska with her husband and two year old son. She is always getting ideas for stories from random thoughts and places, but a lot of inspiration comes from the wide range of people she sees while working front desk at a local hotel. In her free time, Kayla likes to do arts and crafts and also dabbles in knife throwing. As of late, her son and her writing take up most of her time, as well as preparing for a new addition to her family. She plans to continue writing even with a new baby in the family. Follow her on Twitter and Goodreads, or visit her website. You can find Obsidian at Amazon, Barnes and Noble, Smashwords, and many other online retailers. Lisa Lester lives in humongous house with three cats, three dogs, two dudes (one of which she’s married to, the other one is a refugee from New Jersey) and a partridge in a pear tree…okay, just kidding about the pear tree. And the partridge too. When she’s not working for the Man. she’s reading or killing stuff on World of Warcraft. She also enjoys nerdy things like Star Wars, crocheting, and pretty much any kind of music. This entry was posted in Guest Review and tagged book review, discover new books, guest review, kayla curry, martin sisters publishing, obsidian, paranormal, reading, small press publishers, two monkeys.